At 8am on Thanksgiving morning I met for coffee with a middle age man named Leo Hall. Leo lives in Nashville, TN, makes videos and is a substitute teacher. He has two great boys and a wonderful wife. I first met Leo almost 33 years ago when he was in 4th grade, attending an elementary school in the Cabrini-Green area of Chicago. I was a first year employee working in the Advertising Department of the Montgomery Ward corporate headquarters of Chicago. In the fall of 1973 I became a volunteer tutor with the Montgomery Ward Cabrini Green Tutoring Program in Chicago. I was assigned to work with Leo. We met every Tuesday night during that 1973-74 school year, and for the next several years. In the years since then, I've attended every graduation of Leo's, including 8th grade, high school and college. Leo sent me an email Tuesday, telling me he was coming to Chicago, and that he wanted to meet with me. He made special arrangements to be able to join me on Thursday morning, just as I did. We have stayed in contact for 33 years, although we've not seen each other for about six years. Since he was coming to Chicago he wanted to make sure he saw me. He wanted to say "thanks" for me being his mentor for all of these years. While I accepted his "thanks" I also offered my own. I said "thanks" for him letting me be part of his life, and for all of the ways this involvement has become my life in the years since then. When I write about tutoring/mentoring and the infrastructure needed to support such programs, I'm thinking about what it took for Leo and I to first meet in 1973, and to stay connected for all of these years. If some volunteers had not made the weekly commitment for the Wards program to operate, we never would have met. If donors had not provide enough dollars to operate every year, we would not have been able to stay connected. He could not have found me, or me him, if Cabrini Connections were not a home, that connects us, and many others, to each other. As you do your holiday charitable giving, I encourage you to made a donation to a volunteer-based tutor/mentor program like Cabrini Connections so you can help us continue to make these connections between youth like Leo and adults like me. If you view the Chicago Programs Links at the Tutor/Mentor Connection web site, you'll find web site links for Cabrini Connections and for many other Chicago organizations that offer various forms of tutoring and/or mentoring. You can use these to choose places where you might want to make a donation or become a volunteer in the coming year. We all give thanks for the richness that mentoring has added to our lives. We hope that through your giving we'll be able to continue this work for many more years. $2 Million Award supports Chicago volunteer-based tutor/mentor programs! a) building knowledge of who does this work, what works, who supports it, etc. c) working with business and professional groups to create strategies that distribute funds annually to tutor/mentor programs in every part of the city, instead of just to one or two favorite, or highly visible programs. The best example of our success in getting businesses involved has been the work we've done since 1994 to help the Abraham Lincoln Marovitz Lend A Hand Program (http://www.lend-a-hand.net/ ) grow at the Chicago Bar Association. Since 1995 the LAH has been able to award $30,000 to $50,000 each year in small grants to 20-30 different programs. The photo above shows the Thomas A Demetrio Lend A Hand Award recognizing an outstanding example of a Chicago tutor/mentor program, being awarded during a Tutor/Mentor Conference. While these were welcome, the size of the grant means the programs still had to find about 98% of the money needed to operate from other sources. Yesterday the LAH received $2 million from the Chicago Sun Times as part of a legal settlement. These funds will increase the grant pool to as much as $300,000 per year over the next 3 to 5 years, and dramatically increase the size of grants awarded to tutor/mentor programs in the Chicago area. This is the result of our efforts to connect those who can help with volunteer-based tutor/mentor programs who are helping inner city kids reach careers. It's also a result of many tutor/mentor programs participating in the May and November conference, and the August/September Volunteer Recruitment Campaigns, organized by the Tutor/Mentor Connection. The goal of the T/MC is to have the Lend A Hand duplicated in every industry, so that tutor/mentor programs receive funds, and volunteers, from many sources, not just the legal community. The way we hope to achieve this is that more tutor/mentor leaders in Chicago will become active partners in this strategy, and that program leaders in other communities begin to work with the T/MC as collaborators so that the business and professional groups in their own community will adopt this strategy. It’s Veteran’s Day today. I’m writing thank you letters that I’ve fallen behind on and I was inspired to write this post. I’m a Veteran in two ways. I served in the Army from 1968-71 and I’ve served in the war on poverty as leader of a tutor/mentor program from 1974 till today. I’m proud of both. Service requires sacrifice. It’s easy to understand the level of sacrifice given on the battlefield. Yet when I was coming back from Korea in 1971, I felt that my service to my country was not as important because I was not on the battlefield. Over the years, I’ve changed my mind through my leadership of a tutor/mentor program. For the soldiers on the front line to do their job, soldiers behind the scenes need to do their jobs, too. In our war on poverty the volunteers who connect directly with teens as tutors/mentors, and the people who staff tutor/mentor programs are in combat every day. They can tell you the horror stories and the sacrifices they make to help kids who need many types of support to succeed in school in neighborhoods where many expectations and role models support different aspirations. What I've learned is that while we need tutors/mentors, we also need many other volunteers who provide their time as leaders, organizers, web site developers, fund raisers, and as a donors. If non profit tutor/mentor programs can not consistently get this type of infrastructure support, most will not be consistently able to support those who are directly connected with kids. Thus, as a veteran, I thank everyone who is making donations of time and money to support volunteer based tutor/mentor programs that serve kids living in poverty. I hope you'll look at the level of sacrifice being made by those who give their lives and time to military service, and consider expanding your own level of commitment to helping us end poverty by helping kids move through school and into jobs and careers. Once again Chicago and other cities hosted a Principal for a Day event that brought CEOs and celebrities into Chicago schools. The goal was to energize leaders to become supporters of education efforts in Chicago. This year there was a concerted effort to raise money for CPS from this effort. While this is needed, I'd like to see an effort that encouraged businesses to adopt neighborhoods, not just schools. Such a strategy would reinforce the 24/365 learning that is required to help a youth succeed in school. It would point business leaders to non-school tutoring/mentoring and youth development programs, not just the programs offered by CPS during its 9 month schedule and range of summer programs. It would give more opportunities for business volunteers to become engaged and to stay involved for more time than a one-day visit to a school. Such a strategy would not only build stronger relationships with youth who need extra adults to mentor and build career aspirations, but would also help people beyond poverty become more informed of the complex issues that all need to be addressed at the same time, and for many years, if we're to change education outcomes in some inner city neighborhoods. You can see our vision of this strategy in the Tutor/Mentor Institute section of the http://www.tutormentorconnection.org web site. If you know one of the leaders who spent a day in one of Chicago's schools this month, I encourage you to encourage that person to consider support for non school programs in the same neighborhood. I'm writing to recruit bloggers who are talking about charity, and volunteerism, and programs that connect adults with inner-city kids in roles of tutors, mentors, advocates, coaches and friends. If we can increase the number of people around the world blogging this topic, and pointing to sites such as the Program Links area of http://www.tutormentorconnection.org, we can increase holiday donations and give donors choices of where they send those donations. If you're blogging this topic, just post a comment in this section with your blog's web address. If you are aggregating charity blogs, I encourage you to create a sub section that points at non profits that connect adults and youth who do not live in poverty with youth and communities that are dominated by poverty. I'll look forward to reading your posts. 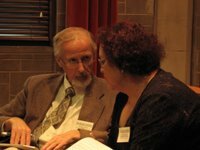 On November 30 the Tutor/Mentor Connection will be hosting a one-day conference in Chicago. It's aim is to share information that helps more and better volunteer-based tutor/mentor programs be available for inner-city youth. While I lead one of these programs and know from personal experience how these programs transform youth and adults, I also know how hard it is to find dollars to operate consistently from year to year. Thus, at this conference my goal is to draw programs leaders together to share ideas, build visibility, and to find ways to work together to draw needed dollars to all tutor/mentor programs, not just Cabrini Connections. The Essential Supports for School Improvement, published by the Consortium on Chicago School Research at the University of Chicago. Policy Brief: Promoting a Systematic Focus on Learning Supports to Address Barriers to Learning and Teaching, found at the UCLA Center for Mental Health in Schools . Open the What's New section and follow the links to the Student Support Initiative. The Big Lie: Reframing Expectations of Afterschool Programs, by Dr. Robert Halpern of the Erickson Institute. If life were a game of 'tag' then my purpose in writing this blog is to 'tag' others who will then carry this message into their own network of friends, family and co-workers. If these people 'tag' others, we can reach millions of potential volunteers and donors, who will be willing to share some of the blessings they celebrate during Thanksgiving and the year end holidays with one or more tutor/mentor programs operating in Chicago or other cities. I hope that Cabrini Connections and the Tutor/Mentor Connection are among the organizations that you support with your donations. What's the connection? 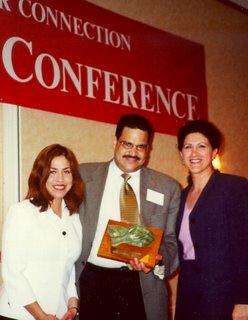 Daniel F. Bassill, president of Cabrini Connections and the Tutor/Mentor Connection, was commended as a Giraffe in 1997. I've been proud to wear the Giraffe pin on my coat for almost a decade. On a variety of web sites and blogs I find people with great ideas about networking. I have a link to the Non profit Blog Exchange, at the left. Network Weaving is another site where you can learn. 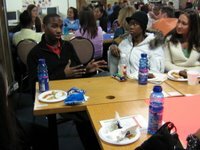 In the Tutor/Mentor Connection Links, I list a variety of blogs and forums where people can connect. I am now organizing a one-day conference for Chicago and am looking for one or two blog/networking experts to participate on a panel that focuses on collaboration. In addition, I'm looking for others to blog this topic in December. Please read about the Conference Strategy and email tutormentor2@earthlink.net if you'd like to help. K-12 On-line Conference - Join in!! RED Alert - Celebs' Anti-AIDS Effort. Can it be duplicated? Today the front page story in my Chicago SunTimes was the story of Bono, Oprah and others launching a campaign to "sell red-colored cell phones in the United States to raise money -- potentially billions -- for Bono's Product Red campaign to help treat African women and children with HIV/Aids." I heard Bono speak at the National Conference on Volunteerism and Service in 2005 and I'm really impressed with this guy and what he's accomplished. Here's my problem. The graphic I show on this page illustrates the many different issues that most communities face, to some degree or another. I'm trying to use this wheel as a navigation tool. Imagine that you could click into any slice of this pie, and go to a web page that focused totally on a single broad issue, such as poverty, or health. AIDS would be listed in both categories, as an issue, but might be addressed by different organizations, competing for the same dollars. Imagine though, if once you're in an issue area, you find another wheel, that breaks down poverty or any of these other categories into sub categories, then provides a map that shows you where in a city, or the world, this was a problem that needed solving, which means it needs money from people like Bono. 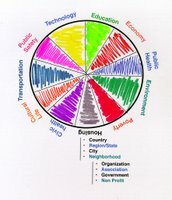 Unless someone is maintaining a database to show what organizations are working in each of these issue areas, and in each of these countries, cities and neighborhoods, it's likely that the money being raised by Bono and Bill Gates and others will not distribute to all of the organizations needing help. It's also likely that most of the high poverty places where help is needed, there are few organizations providing help, so there's no place for funds to be distributed, even if that was the intention. The reality is that all of these slices are inter-related. We just tend to deal with them as silos, with separate organizations and donors providing support to different groups who address the same issue in a different way. I focus on volunteer based, non-school tutor/mentor programs serving youth in high poverty neighborhoods. The reason I focus on non-school is that in big cities, it's hard to get away from work and drive to a neighborhood school where you can spend your lunch hour each week as a mentor. Yet, you might pass through these neighborhoods as you go from work to home every evening. Why not spend one evening at a neighborhood tutor/mentor program. I've led such a program for more than 30 years and more than three thousands volunteers have made this commitment. Over 10% stayed involved for five or more years, and many became leaders and donors. Kids that I first met in elementary school are now college graduates. These programs enable long-term connections and relationships to be formed between volunteers and youth. When that happens, the volunteers are more personally connected, and likley to do more to help solve the poverty and economic isolation that causes tutor/mentor programs to be needed in the first place. Thus there's a value for non-school programs like Cabrini Connections. Yet, we struggle to find the money to pay the bills, or to make enough programs available in enough places. A couple of weeks ago a feature story in the Chicago Tribune on Sunday and Monday was about how Chicago Public Schools had raised $25 million in 2005 from corporations and foundations, vis only $2 million five years ago. While it's great that CPS can raise so much money, that's money that only funds school based activities. It's money that might have funded non-school programs that connect kids with mentors and learning activities that the schools can't provide. We need the Mayor, the CEO of Schools, and a few business leaders and celebrities mobilizing donors to distribute funds to schools, and to non-school programs.... if we really want kids to go through school better prepared for jobs and careers. My goal in showing a chart like this is to encourage leaders to think more holistically about all of the different factors that contribute to AIDs, or to Poverty, or to poorly performing kids coming out of public schools. My hope is to find more people like Bono who will bring business into innovation processes so that we can have yellow TVs, and green shoes, and blue bikes, and pokadot sports tickets, each with some of the profit going to find a stream of charity, or a slice of the pie. If you're reading this any you've got a great marketing idea, I can show you a whole city of volunteer based tutor/mentor programs who each need donations every day. 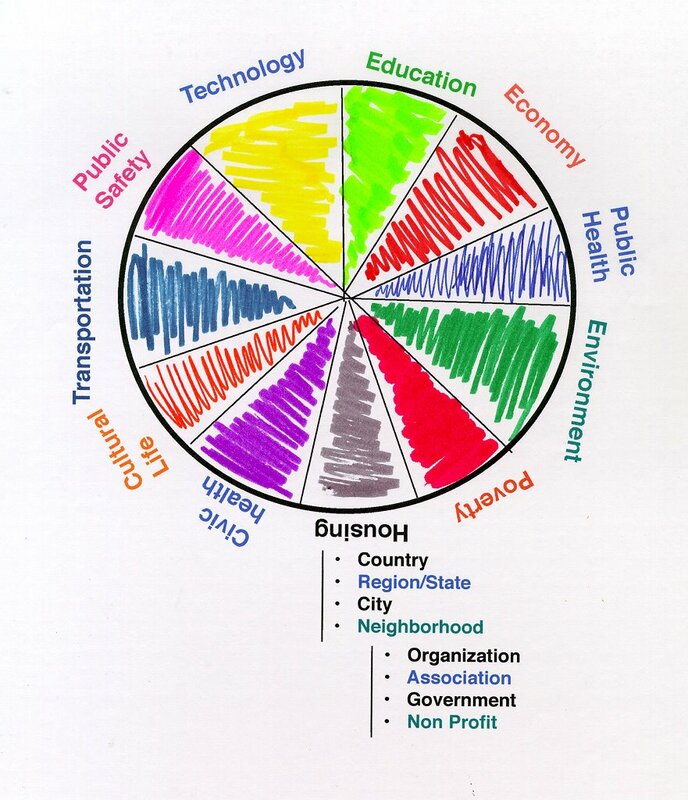 Note, I you can see an example of this wheel being used to draw attention to each issue area if you visit the Boston Innovation Hub (http://www.tbf.org/indicatorsproject/hubofinnovation/innovation.asp ). That's what inspired me to create this graphic. The LINKS library at http://www.tutormentorconnection.org is now fully operational again, after a month of rebuilding that was done after hackers caused us to move to a new hosting site. I hope you'll take a look. The aim of this library is to help leaders, volunteers, donors, youth and parents find information that they want, when they want it. For students, this can help them with homework, help them explore career goals, or connect with peers around the world. For program leaders and donors, the links can be used to benchmark what one program is doing against what others do to solve the same problem. If the donor and the non profit are looking at the same information, and the donor is committed to helping kids in the zip code where they program is located. this shared understanding of what ideas would help improve a program should result in the donor providing the funds for the program to do the work of adding this new idea. The LINKS also provide in-depth information that helps everyone understand the challenges of poverty, and see the opportunities to help youth reach their full potential. There is a lot of information on this web site. However, poverty is a very complex issue, and affects millions of people in the US and around the world. Solutions cannot be achieved by a few minutes of learning. It takes many years of learning, just like getting a college degree and a PdD takes four to 8 years of work. Thus, we hope you not only return to this site often, but that you add new links, rate the links, and discuss the information you find in this discussion forum. In this way we share the work of helping people find and use information that can lead youth out of poverty and to careers. During the past two weeks an amazing thing has happened in Chicago. Volunteers from various businesses and professions have begun meeting with 7th to 12th grade teens from the Cabrini-Green neighborhood for a 14th year of tutoring/mentoring and networking at the Cabrini Connections Tutor/Mentor Program. Josh Rothstein (2005-06 volunteer) emailed to tell us he's moved back to California and will be interviewing in the coming weeks at the Jet Propulsion Laboratory (a NASA contracted facility) in Pasadena. Ted Bills (former volunteer) emailed from St. Louis and said "Our United Way campaign kicked off today and I sent the email to 70+ people that I have met at GE. " These illustrate how Cabrini Connections is turning the meeting between teens and volunteers at our Chicago site into a life long connection made possible by the Internet. With such a connection we can remove the isolation of poverty for every teen who joins us and learns to connect with each other and volunteers via the Internet. In order for us to keep our teens and volunteers connected with each other and with Cabrini Connections, we must constantly raise money. You can make a difference this weekend, by writing a check or going on line and making a Pay Pal donation. Some of you have already received the Back to School Mailing in a Yellow Envelop. Here's a link to a PDF that you can forward to friends. In other sections of this blog you've been able to read posts about how difficult it is for non profits to find on-going dollars to sustain their work. We've been fortunate to find dollars for the past 14 years, but never enough to avoid borrowing money when cash is short, and never enough to do all of the work we know needs to be done to assure that our teens are in jobs by age 25. As you read this, I hope you'll make an effort to help us now, and in the future. I also hope you'll make an effort to help programs like Cabrini Connections that operate in other neighborhoods, and other cities, get the dollars and volunteers they also need. While we change the future for the teens who join Cabrini Connections, we still only impact a small number out of the more than 200,000 youth living in poverty in Chicago and the millions living in poverty in other big cities. A strategy that supports all tutor/mentor programs consistently is one that will also support Cabrini Connections more consistently. On Thursday and Friday of this week the Chicago Sun Times ran stories of mentoring efforts supported by the CEO of ComEd and the CEO of Soft Sheen. These programs are part of a mentoring initiative started by the United Way of Metropolitan Chicago in response to studies showing incarceration rates of young black men at historically high rates. I wrote the SunTimes, and said "thank you" and I called the United Way and said "let's meet". 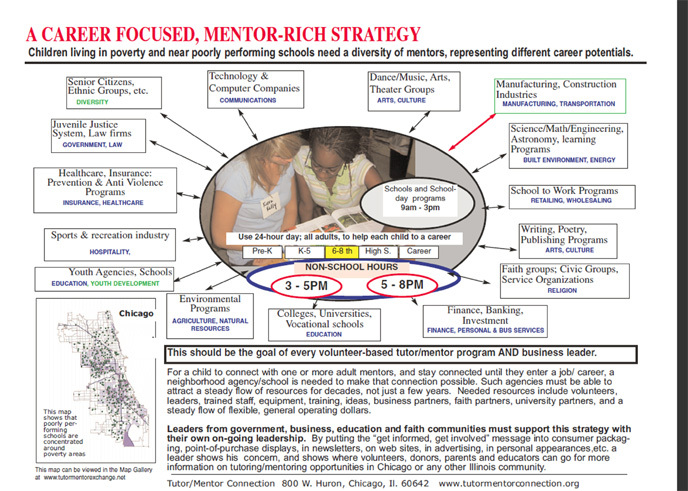 The REST OF THE STORY is that this has been a problem for more than a few years and that there are many organizations in Chicago who already offer volunteer-based tutoring/mentoring and who would love to have help from ComEd, Soft Sheen and every other business in the city. My hope is that the media will link stories they write about one initiative, to existing work already being done in the city, in these, or other neighborhoods, so that the visibility the story draws to mentoring, will draw volunteers, donors, and business partners to tutor/mentor programs throughout the city and suburbs. In the same edition of the SunTimes that talked about how a mentor program keeps young blacks focused was another story with the headline "20-year old slain on Southwest Side". Nothing in the reporting of this story suggested that mentoring or other forms of youth development or career development, could be a way to keep this type of problem from happening, yet the neighborhood where the youth was shot is the same area where mentoring is being offered. 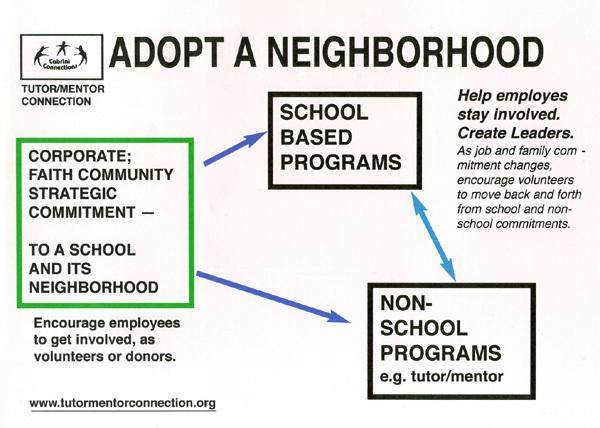 If you want to help make mentoring more available in high risk Chicago areas, visit the Program Locator at http://www.tutormentorconnection.org and search by zip code to locate programs in specific areas. You'll find that some areas don't have many programs, thus, we'll need companies like ComEd and Soft Sheen to help start new programs, while we also need their help to keep existing programs in operation. I hope that the new African American Initiatives at the United Way and at the Chicago Community Trust draw needed reinforcements to existing programs throughout the city. This is the only way we can assure that youth get the adult support needed to stay in school and move to careers. Dennis Whittle, founder of Global Giving has a thought-provoking essay on his Pulling for the Underdog blog. He links to an article written by the from the Stanford Social Innovation Review. As you read this, I encourage you to think of the thousands of places where comprehensive, volunteer-based tutor/mentor programs need to reach kids living in high poverty and near poorly performing schools. Each of these programs needs an innovative, dedicated leader who can attract kids, volunteers, donors and keep programs growing from "good to great" over a period of years. If we can enlist business leaders to innovate ways to distribute needed resources to all tutor/mentor programs on a more consistent basis, we can do much to build a pipeline connecting inner city kids to careers. One strategy leaders might employ is to provide links on their web sites to organizations that mentor kids to careers, then encourage employees and customers to volunteer and donate money through payroll deduction programs to support these programs. The goal is that an executive point to all of the organizations in a city, or multiple cities, that offer tutoring/mentoring and not just to the one that he/she may serve as a board member. 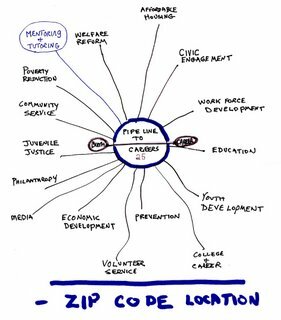 In the Tutor/Mentor Program Locator I illustrate one sort of database that executives could refer volunteers to in order to distribute support to multiple locations. Today in the Chicago SunTimes, Steve Huntley wrote a commentary titled "Lots of Questions to answer before schools get more money." In the article he asked why parents who have sacrificed to have kids in communities with better schools, and higher taxes, would be willing to pay for the costs of educating other people's kids. To me, this goes beyond providing that proposed school reform, and non profit strategies work, it provokes a question of "how do we get more people personally involved so they'd care enough to help other people's kids?" I feel volunteer-based tutor/mentor programs are one of the best strategies the nation might invest in to get adults who don't live in poverty personally connected with kids who do. Through these connections these adults will have a better understanding of the challenges poverty presents, and a more personal reason to use their time, talent and dollars to create change. Unfortunately, there are too few programs building long term connections, and too few dollars to help existing and new programs grow from start, to good, to great. Remembering 9/11 - How much sacrifice is enough? Today people in the USA and friends from around the world are pausing for a few moments to remember the lives lost in the 9/11 tragedy and in the war on terrorism that has taken place sense then. Last week we were pausing to remember the Katrina tragedy. Those of us at Cabrini Connections and the Tutor/Mentor Connection add our prayers of hope and remembrance to the families of those directly affected by these events. However, we would like to go a step further. We'd like to ask everyone to dig a bit deeper and to find a little more time to try to understand the poverty in the world that is a breeding ground for these events. While nature caused the Hurricane, it was poverty that gave us the images of desperate people in New Orleans. While it is a small group of fanatics fanning the fire of terrorism, it is poverty that provides recruits for these fanatics. Thus, it's poverty we need to understand and deal with. In this context, the next question is "how much time, talent and treasure" should one be expected to commit to this war on poverty? In the speeches that will be given today we'll honor those who gave the ultimate sacrifice. The number of dead will be totaled. In the background will be the number of families and children changed forever because a parent was lost in 9/11 or killed or severely wounded in the years since then. When we think of this as 100% sacrifice, how do our own daily commitments of time, talent and treasure stack up? I'm not in a position to say what the appropriate level of giving should be. However, I can look in my own mirror every night and feel good about my own efforts. I'd like to find a way that more people were looking in the mirror every night and doing more than just staring at a pretty face!! Tonight we'll hold our first orientation for the volunteers who will become tutors/mentors in the 2006-07 Cabrini Connections program. As I talk to them I'll be starting them on a journey that is intended to stretch their involvement beyond two hours a week with one of our teens, to a commitment that draws the heart, body and spirit of a growing number into the efforts it takes to end poverty by helping kids move through school and into jobs/careers. We promise our kids "we'll do everything we can" to assure that you're starting a job/career by age 25. "Everything" is a lot. It's unconditional effort. It recognizes the potential of unleashing the talent of our volunteers, their friends and families, the people they work with, and the people they pray with or go to football games with, in efforts to end poverty and provide hope. Our efforts to unleash and focus more of the talents and time of our students, alumni and volunteers are the best memorial to 9/11 that I feel we can offer. Fan donates $220k to send band to football game. How much to help kids get to college? On Saturday night I watched a bit of the Ohio State vs Texas football game. I heard the announcers say that an Ohio State benefactor had provided $220,000 to bring the entire OSU band to Texas for the game. I love football, but I wonder how much that money could have done to help a few more inner city kids get the adult support they need to be able to attend either one of these universities. Maybe this benefactor also gives millions of dollars to charities helping kids.... I hope so. As leader of http://www.cabriniconnections.net I know how hard it is to find $5,000 a month to pay our rent and keep our kids connected to tutor/mentors. Donations over $200,000 would cover the operating costs of my program for an entire year. No Child Law near perfect? No way. Last week Education Secretary Margaret Spellings was quoted as saying the 2002 No Child Left Behind Law was "99.9" percent close to working properly and needed little change when it comes up for renewal next year. In today's Chicago SunTimes there were four articles that I feel related to NCLB, but none seemed intended on relating to each other, or demonstrated a long term vision of how to change the status quo. On a page 23 article titled "No Child law near perfect? Blagojevich begs to differ", Governor Blagojevich was quoted as "joining a growing chorus of critics". On page 34, there was an article titled "A Last Ditch effort to save gang members". This talked about how ministers in Durham, North Carolina, are raising money to send gang members out of state, so they can escape gangs. Does this mean if they send them to Chicago's West or South side neighborhoods they won't be recruited into gangs? No. Poverty is a breeding ground for gangs. While education is the path out of poverty, government has not yet outlined a plan that provides learning supports in the non-school hours, and in all high poverty neighborhoods. On page 40, Tom Sharp of Lincoln Park wrote "Principals don't deserve easy A's"
Tom's article concluded with, "The basic fact that CPS leadership has yet to accept is that the students themselves, there home environments, and the value placed on education by their parents/guardians are the key variables to education success. The teacher plays a secondary role and the principle, more often than not, is a minor player at best. On page 39, Andrew Greeley's column was titled "Greed trumps common good every time". Greeley wrote about "how difficult it is for this large, pluralistic and cumbersome country to accomplish goals that most of its people agree on, more or less." According to Greeley, "one of the major obstacles is greed." He targets big business, saying, "The common good just doesn't matter when big business is running the country -- into the ground." In my opinion, these are articles are all related. NCLB (and government policy) does not provide funding for the wide range of learning supports (including tutoring/mentoring) that would help more kids come to school with greater aspirations and motivations to learn. It does not provide the type of non-school activities that would compete with gangs for student involvement. It does not motivate businesses to use their own resources (people, dollars, technology, jobs, leadership) to help youth come to school prepared to learn, and move through school more prepared for 21st century jobs. Just pointing at teachers and principles, or at the bureaucracy of NCLB, is not providing a vision for how we all work together to solve the problem. Tutor/Mentor programs are learning supports where people from beyond poverty can connect with youth living in poverty, and become extra resources to help youth move through school and into jobs. However, without consistent funding there are too few programs, and too few good programs. Until leadership understands that these programs not only benefit youth, but also transform the adult volunteer into a leader, they won't invest time and leadership into strategies that draw more adults into these programs, or support the operations that retain volunteers for multiple years. In the end, we cannot legislate morality or dictate leadership. We can only recognize and support it when we see it. Thus, when we talk of greed, my suggestion would be to find ways to recognize with our votes, and with our shopping habits, those leaders who do more to make this a better world. If we reward good leadership others will soon learn to duplicate this, or even innovate better leadership. Imagine a day when elected leaders and big and small businesses would be competing with each other to see who could do the most good. A first step would be for editors to link stories in the news to web site forums that draw people together to understand how these stories relate to each other. Another would be to find ways to get more people personally involved. Being a volunteer in a tutor/mentor program is a good way to start that involvement. In most of my posts my focus is on building strategic partnerships with business and professional groups. I often point to web sites such as www.healthworkforce.org/guide/pipeline_sec1_1.htm where industry leaders are talking about workforce issues specific to their industry. These show "WHY" CEO's should take a strategic role in tutoring/mentoring, and provide examples that CEOs in one community can borrow for use in their own communities. This week I'm leading a discussion of CEOs and Volunteerism on the http://www.socialedge.org web site. I hope you'll join in and provide links to other web sites that illustrate why business should become more involved, or that illustrate innovative forms of leadership that draw volunteers, and donors, to volunteer-based charities. School starts in Chicago on Tuesday for over 400,000 kids. Almost half live in high poverty neighborhoods. Many will be attending over-crowded schools. Many will come with few aspirations or experiences that prepare or motivate them to learn. This is the same in every big city of America. As school starts, many in the media will be writing editorials and commentary, lamenting the lack of leadership, or involvement, in solving poverty, or improving schools. One initiative, the Million Dad March, will seek to involve men in getting kids to school this week, and in helping those kids learn. What's missing? While media stories that focus on Katrina, or individual kids are well written and catch some reader attention, they don't create the on-going personal connection that leads people beyond poverty, or who don't have kids in poor schools, to become personally involved. Without a personally connection this remains "someone else's problem". I feel that volunteering in a tutor/mentor program, where a volunteer makes a weekly contact with a youth, is one way of creating a bridge that links people beyond poverty with children and families in poverty. I write about this often in this blog. As school starts, tutor/mentor programs all over the country, including Chicago, are looking for volunteers...and donors. In Chicago you can visit the Program Locator at http://www.tutormentorexchange.net to find contact information for different programs in different neighborhoods. In other cities, you need to search volunteer databases, such as http://www.volunteermatch.org. All of these programs are different. They are not equally good at what they do. However, they are a connecting place where those who want to help can begin to build a personal understanding of the problem, and a personal connection with a young person who will enrich the life of the volunteer, as the volunteer seeks to do the same for the youth. If you are a writer for a radio, TV, or newspaper, or if you know someone who is, I urge you to end your stories about poverty, poor schools, gangs, drugs, workforce development, civic engagement, etc, with links to web portals where people who don't live in the neighborhoods you write about can find ways to become personally connected. If you do this with every story, you will be helping us build this bridge, and we'll begin to have more people read your stories with a personal understanding of what the problem is, and ways to solve it. This is not a race. This is a journey. It takes 12 years just to go from 1st grade to being a high school graduate. It takes another 4 to 8 years to go on through the next level of education and be starting a job/career. Many kids won't make it because too few people are involved personally in helping them along the way. As school starts this week, let's make a commitment to change this. School is starting and we're recruiting volunteers to serve as tutors/mentors at http://www.cabriniconnections.net and other tutor/mentor programs in Chicago. Here's a blog that outlines learning goals that I think would be valuable for all students, and adults, to master. The list is very thoughtful and the comments add additional value. If you can find ways to mentor these skills to your own kids, or to kids who you might meet in a tutor/mentor program, it would be a valuable use of your time and talent. The hub of this drawing represents a single youth. Or, it could represent all of the young people in a zip code, or a community. If the community has high concentrations of poverty, it's likely that the young people are not finishing school, or if they do finish school, they are not as well prepared for jobs, college and careers as are kids who did not live in poverty. This article illustrates the huge benefit to society if we'd just find more ways to help kids born in poverty be starting jobs and careers by age 25. We're reminded of this problem at least once a day in our local newspapers, either with a story about teens killing teens, or high school test scores. Yet, nothing seems to change. Maybe one of the problems is that we're all divided into sub groups, based on how we see the problem, who we are, and where we are. My concept map illustrates this. 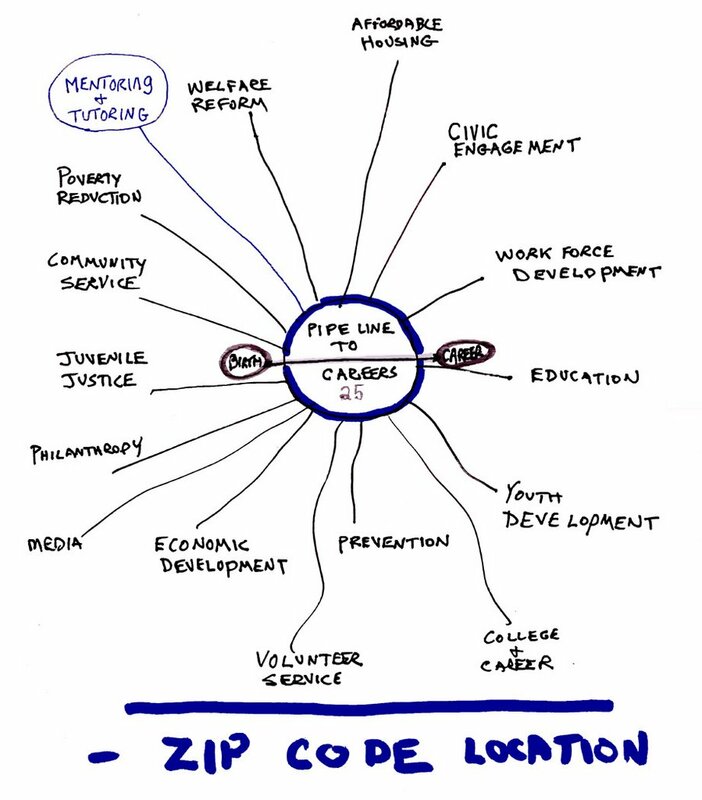 I've heard many people use the term "pipeline to careers", but not many map a strategy that identifies all of the different resources that are available to kids not living in poverty, which need to be made available on an age appropriate, continuous basis, to more of the kids who do live in poverty. My concept map illustrates that there are many groups of people/organizations who are working to end poverty. However, they are not connected to each other, the way sub contractors are connected to each other in the blueprints that are used to build a house, or a tall building. Because of the way philanthropy and public attention work, we spend billions to fund lots of different actions, but don't achieve the results we want because the funding does not go to all of the different groups in a zip code who need to be in that zip code, nor stay there on an on-going basis until the neighborhood reaches a "tipping point" in which a majority of kids are headed to school with positive aspirations, the motivation to learn, and a network of adults available, and willing to help them. The reason I'm so positive about volunteer-based tutoring/mentoring is that out of all of the ideas represented on my map, this is the only one that has the potential of getting large numbers of people who don't live in poverty, personally involved in the lives of young people who do live in poverty. I know from my own experiences that the longer a person stays involved, the more he/she will understand what the issues are, and the more they will be willing to devote a greater amount of time, talent, dollars and personal involvement to helping a child who is not their own have the same opportunities for college and a career as if they gave birth to that child. School is starting and all over the country tutor/mentor programs are looking for volunteers. They are looking for donors and leaders, too. I hope that anyone who reads this will get involved, and encourage others to get involved. However, I also hope that people who are working with social networking, collaboration, e-learning and other concepts that might help people get informed, then involved, will work with me to create a process of convergence that links leaders, volunteers and donors who are represented in the different sub groups on my map, with each other, in a process that leads to more comprehensive, and longer-lasting strategies for helping youth move up the pipeline from poverty to careers. If you're interested in learning more, or helping me create computerized concept maps, visit the Tutor/Mentor Institute section of http://www.tutormentorexchange.net to view additional essays that show how maps can help create understanding and shared commitment to building more and better volunteer-based tutor/mentor programs where they are needed. One of the features in the Perspectives Section of the Chicago Tribune today was on the 10 year anniversary of welfare reform. While giving credit for moving people off the welfare rolls, the story focused on what we need to do to move those people from the working poor to higher income levels. The solution is education. I use charts to illustrate the time line/opportunity line of preventing poverty or developing future workers. The left end of that line is when a child is born. The Right end stretches to the mid twenties, when that young person should be in the beginning stages of a career. The gray area to the right of this is the rest of a person's life. I use maps to show all of the places where the left end of this time line needs to be reaching kids in specific zip codes. Right now, there are too few of these connections and most don't have long-term career focused vision, nor the funding consistency to provide services for that many years. Kids grow through pretty well defined stages of preschool, elementary school, middle school and high school. If kids were born in high poverty, they begin to drop out of this system mentally by grade 3 and 4 and physically by 10th grade. Check the high school drop out rates for your city and you can determine how much of a problem this is. Welfare reform focuses on providing retraining for adults who already did not get the tools they need the first chance they had to go through this pipeline. Thus, the costs are much higher to re-educate a person when they are an adult, and the probability of success much lower. It would be much more cost effective to surround a future adult with a learning support network, like a tutor/mentor program, when he is young, and keep it their as he/she grows up. If you don't agree, look at some of the cost of poverty studies that show the cost of a person entering a life of crime to be $1.6 million or more. The cost of a youth in a tutor/mentor program for 20 years could be $20,000 - $40,000, depending on the costs of space to operate such a program, the size of the program, and the range of activities. These two discussions are linked. Community Foundations are struggling to survive in an environment where others are channeling donors directly to charities, or showing donors ways to hide their money so it doesn't go to anyone but the family tree. In this discussion Phil Cubeta makes a case for leadership. He wrote, "At some point you either step up and represent what is best in this country and our moral and civic traditions, or you may as well pull over and let the financial companies go by you like an 18 wheeler high-balling down the highway with the horn blasting. " I think this leadership opportunity extends to anyone who is concerned with the future of this country. While I don't expect corporate institutions to change focus on bottom line, I do believe that individuals who lead corporations can, and should provide moral leadership. Last time I looked, many of these people professed to be members of faith communities. There are many places where people can meet to talk about ways to build an education based pipeline to careers. One is http://www.tutormentorconnection.org. So far, we don't have enough of the right people (foundation, business, faith and university leaders, etc.) using our forum to lead this discussion, so we look for ways we can join in their discussions. Yet, I don't find many places on the internet where this is happening, or where the discussion points to maps of cities like Chicago, and to the places where dollars, volunteers, leaders are needed to fill the pipeline with programs that mentor kids to careers. You'll find that at the T/MC site. I encourage you to include this in your discussion and deliberation on the next steps of welfare reform, or the ways to make community foundations viable. Today’s Chicago Sun Times front page headline was “ Fake Gun, Real Anger”. The headline was caused by the shooting of a 14-year old boy by Chicago police. The anger was caused by a long-term lack of trust between inner city youth and police, as well as the way residents feel they are being “pushed out of the Cabrini Green area by developers” and gentrification. On page 14 and 15, the Sun Times devoted two full pages to this story. One part provided the justification by police. A second article talked about the frustration of residents who are being pushed out by the new development in Cabrini Green. This is what was in the paper. What comes next is “The Rest of the Story”. If you want to get involved and change what's happening in inner city neighborhoods, please read on, and encourage your friends and co-workers to also read this message. With school starting in a few weeks, it would be great if there were two full pages in the Sun Times, Chicago Tribune, Cranes, and other Chicago media focusing on the way volunteer-based tutor/mentor programs can help kids make better life choices, and have better success in schools. Mr. Brown’s article focused on the sensational history of Cabrini Green. It did not tell the story of kids who have finished school, thanks to volunteers like those who are buying condos in Cabrini Green. The editorial could have suggested that volunteer-based tutoring/mentoring programs like Cabrini Connections, or Cabrini Green Tutoring Program, are places where the people buying these high priced condos, and the kids living in the neighborhood (now or in the future) , might meet to learn more about each other, and to build community and family type bonds centered around helping raise the kids living in this new mixed income village. The SunTimes story did mention that the father of youth who was shot is a “former gang member with 33 arrests on his rap sheet and a conviction for misdemeanor battery” and that some of the boy’s siblings are ‘bad kids’, according to the father. The people moving into Cabrini Green condos probably have not spent much time learning about poverty, other than reading news stories like today’s paper. If they did, they’d learn that some of Chicago’s neighborhoods are “dumping grounds for ex-convicts” meaning that the most common role model might be someone who has a rap sheet, or who is currently an active gang member. If we don’t surround young people with mentors who don’t have “rap sheets” or who have gone to college and work in a variety of honest jobs and careers every day, how can we change the aspirations and expectations for these kids? If we don’t create informal places where inner city kids and people who don’t live in poverty can meet and build bridges of understanding, how can we expect to reduce the tension? School starts in a few weeks and there are many high poverty neighborhoods of Chicago where kids like Ellis Woodland live. 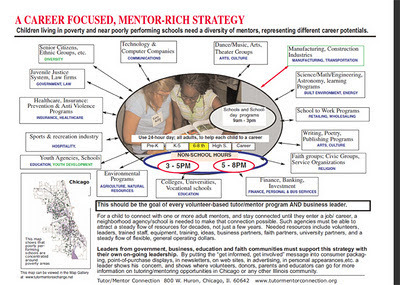 Tutor/Mentor programs in these neighborhoods, and in Cabrini Green are seeking volunteers. They are also seeking donors who will help provide the money to operate these programs. We've been enriched by Michael's presence, and greatly aided by his work here this summer. We hope he'll continue to use his blog, and his time, to support the T/MC, even when he returns to Hong Kong. That's the power of the Internet. It enables people from distant worlds to connect and build a shared commitment to one world. The people who organize the program that brought Michael to Chicago found Cabrini Connections and the T/MC because of our internet strategy. We hope others will find us and that more students like Michael will intern with us, then take the T/MC ideas back to their own cities, states and countries, where they will continue to work with us, but with a focus on their own geography. Thank you Michael for the time you have spent with us and for your many contributions. For the past week the Chicago Sun Times has been giving major media space to the way Illinois State Senator James Meeks, who is also pastor of Salem Missionary Baptist Church in the Roseland area of Chicago, delivered a message about the miserable condition of schools and education opportunities for kids living in highly segregated, high poverty neighborhoods. You can follow these stories at the http://www.suntimes.com web site. Since the minister blamed the Mayor, Richard Daley, for the condition of schools, the Mayor has been responding. Since the minister used the N-word, the media are also making this a front page issue. I think the media, the minister and the mayor are missing an opportunity. The minister wants the mayor and the majority ethnic community, mainly White people, to do more to help improve schools in poor neighborhoods. More money to hire high quality teachers and improve facilities is the goal for the minister. The media and the mayor are responding to the way the minister delivered this message, using the N-word in his sermon last week. All of this sells lots of papers for the Chicago Sun Times, but does little to change the education opportunities for inner-city kids. No matter how correct the minister may be, nothing will change on the public funding level in the next four weeks. Maybe not in the next four years. Furthermore, if you read the information posted by the UCLA Center for Mental Health in Schools, just pouring more money into teacher pay and facilities is not going to change the outcomes for inner city kids because it does not change the availability of learning supports for kids in these schools. None of these mega-leaders are talking about learning supports, or the long-term strategies that would lead to more people, or all races, creeds and color, becoming personally involved in efforts to help inner-city kids succeed in school and move to jobs and careers. Just by putting more money in teachers and facilities won’t change the make-up of the communities where these kids live, which are high poverty, where many of the most prominent role models are adults who are working in illegal trades, have dropped out of school and/or are ex-convicts. Just writing infrequent, but sensationalist, media stories, making speeches, and marching in the streets, won’t get more people personally involved in helping other people’s kids grow up. The minister, the mayor and the media need to be thinking of new ways to get business people (of all colors, and from the city and suburbs) personally engaged in the lives of economically-disadvantaged kids. To me, that means they should be talking about volunteer-based tutoring/mentoring, and the places in poor neighborhoods where people who live in the suburbs, but work in the city, could be spending a couple of hours each week as a tutor/mentor instead of fighting the rush hour traffic. These are also places where people who live in the city and in these neighborhoods, could also be involved, as leaders and organizers of tutor/mentor programs. They should also be talking about how churches, banks, and community health centers in high poverty neighborhoods, and along the routes city workers take in coming and going to work each day, could be hosts to tutor/mentor programs, creating more places where kids and volunteers can meet. Finally, they should be thinking of ways to encourage people who go to church every Sunday might give 2 to 3% of their wealth each year to support these tutor/mentor programs. There just is a limit to how much public money is available. Non school programs need an infusion of private sector and corporate money. Who better to lead in the giving than people of faith? If we expand the number of adults connected with kids, we immediately provide learning supports that can change the aspirations kids bring to school. And, we create a strategy that bridges the divides separating rich and poor, and people of different colors from each other. If we increase the number of people engaged in mentoring, and systematically educate them on what they can do to change public policy, we could have a different public funding system in place a few years down the road. If we don’t think of how to expand the choir, we’ll just keep preaching to a small group of followers. That won’t do much to change the disadvantages that inner city kids face and it won’t make Chicago a better city for everyone to raise their kids. I encourage the mayor, the minister, the media and the masses to visit the Tutor/Mentor Connection on the http://www.tutormentorconnection web site. Here we all can meet, share information, learn about tutoring/mentoring programs, and find places where people can be a volunteer, a donor, or a leader. There are still four weeks in August when media, mayors and ministers, as well as leaders from other industries can be encouraging employees, faith members and friends to get involved in tutor/mentor programs. Through this involvement many will begin to take a personal interest in the things the minister and the mayor are talking about, and this can lead to the changes in public policy and public funding, that will lead to more systemic changes in how we help economically disadvantaged kids get lifelines out of poverty. To me the most important part was reporting the recommendation to "give kids an alternative to gangs through after school programs, summer job programs, and drug prevention education". I agree. That's what I try to do at http://www.cabriniconnections.net. This is a comprehensives volunteer-based tutoring/mentoring program that seeks to compete for the participation of kids by providing learning and enrichment and mentoring in the non-school hours. 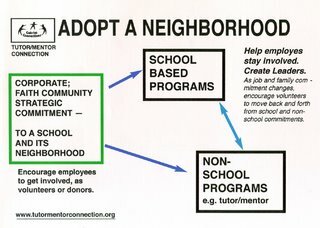 At http://www.tutormentorconnection.org you can see how we're trying to help programs like Cabrini Connections be available in all poverty neighborhoods. Unfortunately, there are too few dollars to support the growth of programs like ours, and too few programs in most of the neighborhoods that are a breeding ground for gangs. Thus, if you want to see less gang activity in your suburb, or in the city, I encourage you to visit our web sites and look for ways you can support the growth of tutor/mentor programs with your time, your talent, your leadership and your dollars. Don't wait for the government, or the school board, or the other guy to take this responsibility. Look in the mirror at the end of each day and tell yourself what YOU did to make more and better non-school learning, mentoring and career education programs available in neighborhoods where gangs have taken over, or will take over, without your involvement. Send a contribution to support our work, to: Cabrini Connections, Tutor/Mentor Connection, 800 W. Huron, Chicago, Il. 60622. We are a 501(c)3 non profit. At the Tutor/Mentor Leadership Conference in May, many of the discussions focused on recruiting volunteers. In the photo at the left I'm talking with a leader from Rockford, Illinois. Today I met with other members of the Abraham Lincoln Marovitz Lend A Hand Program (http://www.lend-a-hand.net) to review nominations for the annual Lend A Hand Awards which will be presented in a gala event on July 12. One of the nominations was submitted by Beth Palmer, Executive Director of the Inspired Youth Program. In her nomination of an attorney from the firm of Holland & Knight, Beth wrote "We met Lisa in September 2004 at Borders Books on N. Michigan Avenue at the recruitment fair, "What a Difference a Day Makes". In October 2004 she came to tutor in the Inspired Youth Tutoring Program." Beth's nomination went on to tell of all of the ways Lisa has been making a difference for the Inspired Youth Program and the kids it serves. This happened because the Tutor/Mentor Connection has been organizing the annual volunteer recruitment campaign every year since 1995 and because Beth Palmer has been participating for most of those years. Since 2003 we've not had funds for a part time staff person to organize the annual campaign, so it's been more difficult. Yet, it was 2004 when Beth's volunteer joined her, so this shows that what we're doing is still helping programs get new volunteers. It's time to get serious about the 2006 campaign, which kicks off on August 1. This campaign is mostly a media campaign. It works when lots of programs find ways to tell the story of individual youth and volunteers who meet in their program. Our goal is to get tutor/mentor stories into all sorts of print, radio, TV and internet media, starting in early August, and continuing each week, like Advertising, through the middle of September. The goal is to have each story point to the program that originated the story, and to have a line saying "learn more about tutor/mentor opportunities in the Chicago region. Go to the Program Locator at http://www.tutormentorconnection.org"
As long as each story finishes with this line, every story will contribute to the movement of an army of potential volunteers to the Program Locator on the T/MC web site. In this section people can search by type of program, age group, time of day the program operates, or the name of a program, to locate contact information and web site links for specific programs in those areas. Of course, this dose not work for you if you don't have your contact information up to date in the Program Locator. We've added a new feature that enables you to edit your information, or to add a new program location. You'll need to email the T/MC at tutormentor2@earthlink.net to learn how to register to use this. Once you do, you'll find its easy to keep up to date. Beth wrote about Lisa, "She was an innovator in Inspired Youth from the beginning." Imagine having a few volunteers like that in your organization. It can happen if you take an active role in the recruitment campaign, and if you start planning for the campaign now, when there are still a few months to develop stories and find ways to distribute them to potential volunteers. If you're reading this and you're not in Chicago, contact me and let me help you create a Tutor/Mentor Connection strategy in your own community. Tonight is the annual celebration of one more year of tutoring/mentoring provided by Cabrini Connections. This will be the 33rd dinner for me, dating back to 1973 when I first became a volunteer. Cabrini Connections (http://www.cabriniconnections.net) will have 7 seniors graduating from high school this spring. They join a growing number of alumni -- like James, shown at the left in the photo above. James graduated last year and this photos shows him sharing his experiences with younger students and volunteers during a March Career Day event hosted by the Junior League of Chicago. The student alumni, who have graduated from Cabrini Connections every year since 1998, are out of high school, but most are not yet at age 25 or at a point where they are anchored in jobs and careers. We have 6 juniors, 12 10th graders and 19 in freshmen in this year's class, plus 32 in 7th and 8th grade. Thus, while we celebrate the graduation of our seniors, we need to find the $200,000 it will take to offer Cabrini Connections again next year and in each of the following years, if we're to help our younger students have a year end dinner when they are seniors, and if we're to find ways to help our alumni be starting jobs and careers over the next 4 to 8 years. We cannot do this without your help. Non profits around the country are struggling to find donations and funding. Those who work with inner city kids, are not as visible as those who deal with AIDS, or Cancer, or who respond to tragedies like Katrina, or the Tsunami, or the genocide in Darfur. Thus, it's up to those who have been part of Cabrini Connections, as a student, or a volunteer, or a past donor, to decide how important it is for this program to be available next year and in future years. There are three ways you can help. a) make a donation today, using the Pay Pal on one of the links below, or by writing a check and putting it in the mail this weekend. c) tell the story of your involvement via a blog or some other form of story-telling and networking. You've been part of the dinner in the past. Many of you have been involved with Cabrini Connections for 3 years or more. You have many stories. Tell them to people you know and invite them to help keep this vision alive. At http://www.cabriniconnections.net/sponsor05.06.htm you can read about how you can be a sponsor of the 2006-07 program. 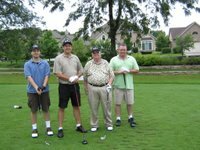 At http://www.cabrinitmcgolf.org you can read about how you can be a sponsor of our annual Jimmy Biggs Memorial Cabrini Connections Golf Benefit. There are many issues in most people's mind that are more important than helping an inner city youth connect with a volunteer tutor/mentor. However, for many Cabrini Connections alumni, this connection has changed the way we understand poverty and the way we think of our own responsibility for making this a better world. I hope you will help me keep find the money it takes each month and each year to repeat the September through May activities that least to each year end dinner celebration. Where does the courage come from to fight the un-winnable fight? Some times when I am getting up in the morning, or driving to work, I am overwhelmed by the magnitude of the obstacles I face in trying to create a system that would connect kids living in poverty with the adult support they need to help them through school and into jobs and careers by age 25. I was in the Army, but never in combat. So I don’t know what a soldier might feel when he is told to do a job that seems impossible and will lead to almost certain death. I wonder which fear is worse: being in a World War 1 trench and getting ready to charge a enemy across an open battlefield, or driving in a convoy from one location to another and not knowing when and where a roadside bomb is waiting to end your existence. I’m sure that the fear these brave souls face each morning as they anticipate their day is much greater than mine as I face my day. Yet, I’m not sure that the battles we fight are any more winnable. Nor am I sure that it is any less important to do battle on foriegn soil than it is to fight for the heart and soul of a young person living in the battlefield of inner-city poverty. Maybe one of the inner-city teens saved by a tutor or mentor will become the leader who finds a way to build peace through different means than invasion or terror. During the past week, I’ve hosted a conference in Chicago where nearly 200 tutor/mentor leaders of volunteer-based tutoring and/or mentoring programs came together to share ideas. Many connections were made. Many ideas were shared. For example, On Friday, a couple of people from a local college and the leader of a local program, told of how they had met through the conference, and might now work together. This is one of many similar connections. I wonder where I’ll find the help to host the next conference in November. On June 1 Cabrini Connections will host its annual year end dinner. We have 7 seniors graduating this year. We have three teens and one volunteer going to Ireland in August. I have heard from four different alumni this past year, telling me how important Cabrini Connections was to them. We have 56 teens who will be returning in the 2006-07 program, who will need our continued help next year, and for the next 4-5 years. I wonder where the money will come from. I take the little victories out of my battles and use them to fuel my everyday courage. I try not to think of the huge obstacles, but focus on what needs to be done -- and what I can do -- in the next few moments. At the end of each day, I look back and see the progress I’ve made. I don’t compare it to the size of the mountain of obstacles ahead. That’s what keeps me going. I do it because it has to be done. I honor those other people who have similar perserverance in the face of obstacles and who sacrifice their lives for a noble purpose. As I write this post, the big question is "Who Cares?" Who cares enough to get personally involved with time, talent, treasure, and to stay involved for many years. With so many other issues bombarding us every day, how do we create a focus on the 13 million kids living in poverty, and on the various programs that are working to help end poverty by helping a youth through school and into a job/career?